16. Yes, There Ain’t No Moonlight – So What? 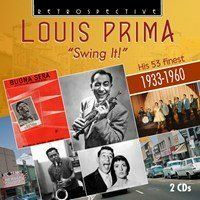 The priapic New Orleanian Louis Prima started recording in the early 1930s and continued for just short of three decades, by which time his down-home trumpeting had become more or less a distant memory. Those were The Jungle Book years when Prima was King of the Swingers paying homage to the real King Louie in his impersonation of his fellow Louisianan. But back in 1933 he was busy in New York embarking on a series of recordings with varying personnel. There was the chamber jazz of the Hotcha Trio, with David Rose’s articulate pianism and Norman Gast’s very Venuti-inspired violin playing. By the following year he was in a hot-shot recording outfit under his own name, Louis Prima and his New Orleans Gang. The gang included luminaries such as George Brunies, Sidney Arodin, Eddie Miller, Claude Thornhill, George van Eps, Nappy Lamare and company, though not all necessarily at the same time. Thornhill’s elegant playing at the piano is somewhat at odds with the ebullient front line though when Pee Wee Russell joins the following year, by which time the band has pretty much changed personnel entirely, a new and very personal voice is added. It’s far more enjoyable listening to his clarinet on Basin Street Blues than it is to Prima’s showboating vocal. It’s certainly interesting to hear Prima’s original version of his own Sing, Sing, Sing before it became colonised by Benny Goodman in the famous Jimmy Mundy arrangement. By the war years the song selection was encroaching on vaudevillian with a strong admixture of raucous band vocals, and the band members were becoming increasingly invisible, if not downright unknown. Prima trotted out cast-iron favourites like Bell-Bottom Trousers and Brooklyn Boogie but the larky stuff with vocalist Lily Ann Carol, good as she is, hasn’t worn well and nor has the honking tenor (a sign of the times) on Lionel Hampton’s Hey, Ba-Ba-Re-Bop! But when, in the late 40s and early 50s, he was joined by wife-to-be Keely Smith and by the iron-lunged tenor player Sam Butera – who’d played in the club of Louis’ talented brother Leon back in New Orleans - things looked up. Smith was, facially speaking, a wonderful ‘straight man’ to Prima’s rapacious mugging and Butera led The Witnesses with authority. From then on, the punchy jive-and-wail stuff took over and it remains splendid to hear – lively, witty, pugnacious, and buoyantly rhythmic.Just a Gigolo and Buona Sera, Hey, Boy! Hey, Girl! and That Old Black Magic – it’s hard to say which is the most infectious. Prima still played a tight trumpet, his singing was audacious and knowing, Smith was ever-excellent in the role she’d carved out for herself. By 1960, a blowsy version of Wonderland by Night with unknown personnel pretty much signalled a farewell to serious recording from Prima. He lived on until 1978. This well produced twofer comes with fine Digby Fairweather notes. He’s too honest to push Prima higher up the Jazz ladder than rightly speaking he deserves but he was a force of nature and more often than not a force for musical good.